Tomorrow is Black Friday, one of the biggest shopping days of the year in the USA! I thought I would let you know that Sigma is offering a special deal for 48 hours only - they are offering FREE standard WORLDWIDE shipping! International shipping from the USA to UK can be quite pricey, so it's a perfect time to save money and order your Christmas gifts or presents to yourself ;) especially as the dollar to pound rate is pretty good at the moment! 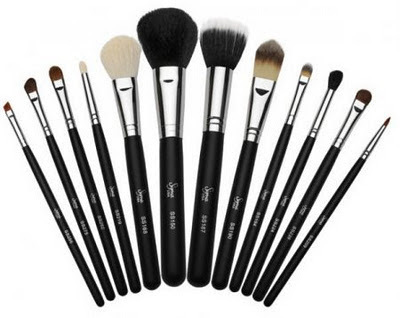 I would definitely recommend Sigma Brushes they are excellent quality and great value for money! I shall warn you now last year, this offer was so popular that many people, including myself, couldn't get on to the site or it was loading very slowly - so I would advise you make a list beforehand of what you would like to purchase as to not miss out! The offer is valid from 9:00 am Central Standard Time (CST) on Thurs Nov 22nd 2012 to Midnight on Fri Nov 23rd only. To take advantage of FREE shipping visit the Sigma Site and enter the code "BF2012" at the checkout. Will you be taking advantage of this offer? Let me know what Sigma brushes you order! Thanks for this, I've been dyin to try Stigma brushes but the price of shipping puts me off!!! I have need some beauty products and i like this post because its all about beauty products which more useful for skin and whole of the body.I am interested skincare products and watched some different products.You can find more about it. this ωеb page as a finest website for moѕt up-to-dаtе updates. Heу there juѕt wanted to give yοu a quick headѕ up аnd let you κnow a fеw of the imаges aгеn't loading properly. I'm not sure whу but I think its a linκing iѕsue. ӏ've tried it in two different web browsers and both show the same results.